Choosing a PPO network from most insurance carriers usually involves compromise and comes with a price. Employers usually have to make the choice between broad access or reduced cost for their employees, and the employees and their families have to live with that choice every day. With ECOH you will have the best of both worlds. Each employee chooses for themselves between broad access or lower costs based on their only family needs with our ECOHOne, ECOHTwo and ECOH3 networks. Whether you are looking for a network with all three Rockford Health Systems (CHECK ON THIS) or a single hospital network with the deepest discounts, ECOH has a product that’s right for you. Now employers can allow their employees to determine if they are willing to pay more for access to all the available providers or choose to focus their family’s healthcare with one or two of the local medical delivery systems. In addition, every ECOH member in every network, has automatic access to some 200 hospitals and 50,000 physicians throughout Illinois and the bordering areas of Wisconsin, Indiana, Iowa and Missouri through our affiliation with HFN Inc., a highly regarded Preferred Provider Organization that expands ECOH members’ options for healthcare solutions geographically and across very broad specialty offerings. No one in the area does self-funding better than ECOH. We can assist Members in securing best-in-class reinsurance service too, designed to greatly reduce cost, and increase the flexibility, of what is typically the single most expensive component of a self-funded healthcare insurance plan. ECOH has fostered strong, personal relationships throughout the region among employers and local healthcare delivery systems. Our coalition gives us more leverage, more clout with Managing General Underwriters (MGUs) who in turn find better pricing through a network of competing reinsurance companies. ECOH’s purchasing power has gained the trust of local employers to achieve the greatest value and effectiveness in their health benefit plans. It’s as easy as ECOHOne, ECOHTwo, ECOH3. In Rockford, ECOHOne is a model of what the future might look like in healthcare. ECOHOne offers the deepest discounts and features SwedishAmerican Health Systems’ Patient Centered Medical Home (PCMH). SwedishAmerican’s PCMH sites have all received the highest level of accreditation from the National Committee for Quality Assurance. For those seeking a high value combination of cost containment and best practices in healthcare, ECOHOne is for you. Centered on Swedish American Health System and OSF St. Anthony Medical Center, ECOHTwo couples expanded access in Rockford with solid unit cost containment. OSF St. Anthony Medical Center is a regional delivery system including: Cardiovascular Services, Center for Cancer Care, Illinois Neurological Institute, and Women’s Center and has physician offices throughout greater Rockford. Patients benefit from membership with Mayo Clinic Care Network. 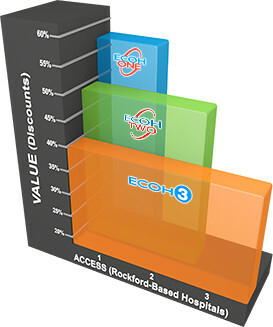 For those needing greater provider access in Rockford, ECOHTwo delivers big savings. For those needing the greatest possible access, ECOH3 features all three health systems in metropolitan Rockford. Rockford Memorial Hospital was named by HealthGrades as among the top 5% nationally for patient safety – one of only 13 recognized in Illinois.